Bottle from Biershop BW - hazy dark brown color with red reflections. off-white head. taste is dark malts, caramell, dark chocolate, fruity yeasty notes. medium sweet, nice medium thick body. crisp and refreshing, extraordinary. Hefetrübes dunkles Braun mit reichlich Schaum. Malzig, leichte Röstaromen, Vanille, Bananen, cremig, sehr süffig. A decent to good Dunkle Heffe Weisse with a dark not too roasty taste from the onset. Makes you want to explore this genre more. 500 ml bottle poured a clear reddish brown with a small lasting creamy tan head. Aromas of caramel, bubblegum, wheat, yeast and clove. Palate was liught to medium bodied and smooth. Flavors of wheat, caramel, yeast, clove and bubblegum with a smooth lingering clove finish. 0,5l bottle Thanks to European Secret Santa 2014 - Bottle was shared. Appearance:cloudy dark brown with a steady offwhite head. of 2 fingers. Aroma: wheat and yeast, banana, and hint of roastyness. Taste: Roasted wheat, dark bread, banana yeast, malt and fruits, moderate sweet with a hint of sourness. medium body. average carbonation.Easy drinkable. Quite Decent, Dunkleweizen. 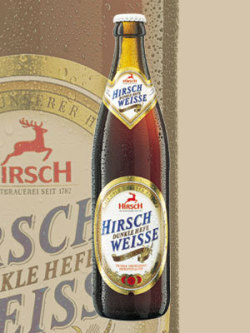 Wie erwartet wieder ein typisches Hirsch mit einem Hefeblock im Mund und einer Muffigkeit, die im Laufe immer heftiger wird. Ab und zu ein paar überreife Früchte und das war es dann auch. Geht so. Bottle from Getränke Beck in Reutlingen. The beer has got a cloudy dark brown colour with an steady head and medium body. Aroma of wheat and yeast. Taste of roasted wheat, dark bread, yeast, malt and fruits. Easy drinkable and solid in its style, yet nothing special. Couleur brune sombre, fort col de mousse blanche. Bon nez cremeux, fruité banane et céréales, Gout doux et cremeux de fruits, bananes, blé, malt toasté.. vraiment agréable a boire. 500 ml bottle in Garmisch, Germany. Pours a dark caramel color with off white head. Aroma is esters, pineapple and bananas. Taste is roasted bananas, wheat and creamy lightness. Palate is smooth and light for style. Nice stuff.